This last week, I have been dying twelve scarf warps. I am planning to take part in 2016 Studio Tour King: http://www.artssocietyking.ca/studio-tour-king.html The dates for 2016 have not been posted yet but it is usually the last weekend of April. I have never taken part in a Studio Tour so it should be interesting and I am looking forward to it. I will be selling scarves and small bags on the tour, the same type of bags as I am selling on my website. My friends Pat Earl http://www.rhga.ca/patricia-earl/ who is an amazing painter, and George Burt http://www.bradfordartsguild.com/george-burt.html a wonderful wood worker, usually take part in the Studio Tour as well. A while ago I order some silk from Georgian Yarn Company: http://www.handweaver.us/georgia_yarn_company.htm It was the first time I had bought from Michael. He provides great customer service and his prices are very reasonable, probably the best around. I bought a kilo of 20/2, and a kilo of 30/2 mulberry spun silk, natural. I am planning to use the 20/2 silk for projects where I incorporate tablet bands, and the 30/2 silk is the silk I used for the scarves. I made eleven scarf warps from the kilo of natural 30/2 silk and I have a some left over I am planning to use as weft for one or two of the scarves. I also had enough 30/2 Tencel for one scarf warp so it meant that I had twelve scarf warps to paint. 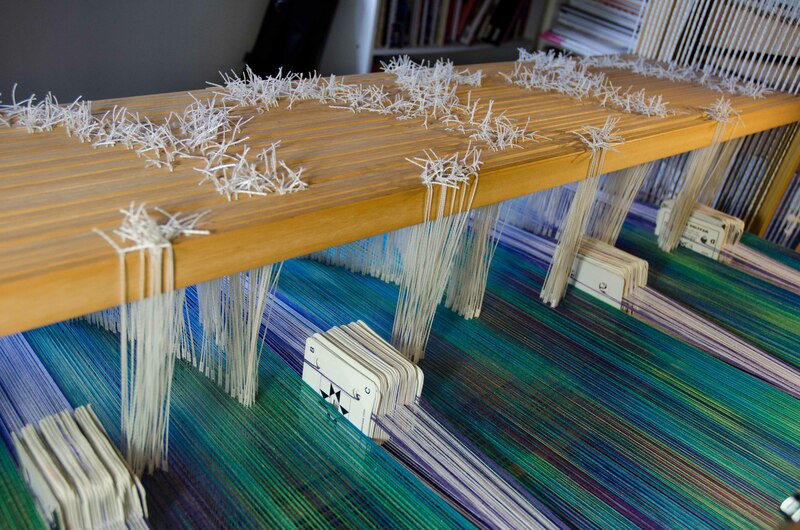 After the warps were wound I prepared my work tables by placing plastic and newspapers on them. I then mixed the colours I was going to use. I use Procion MX dyes because I find them easy to work with. Before the warps could be painted they had to be scoured and after that was done they were arranged on my work table one at the time and painted. 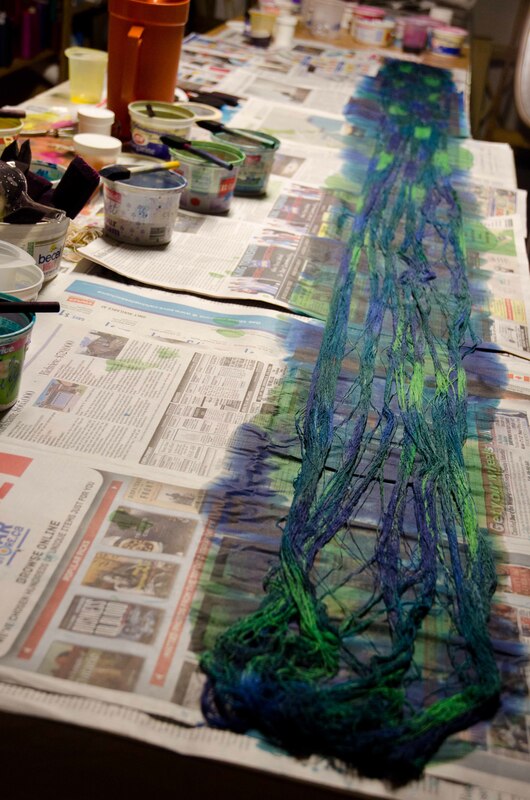 After each warp was painted I wrapped it in a plastic garbage bag and took it outside. 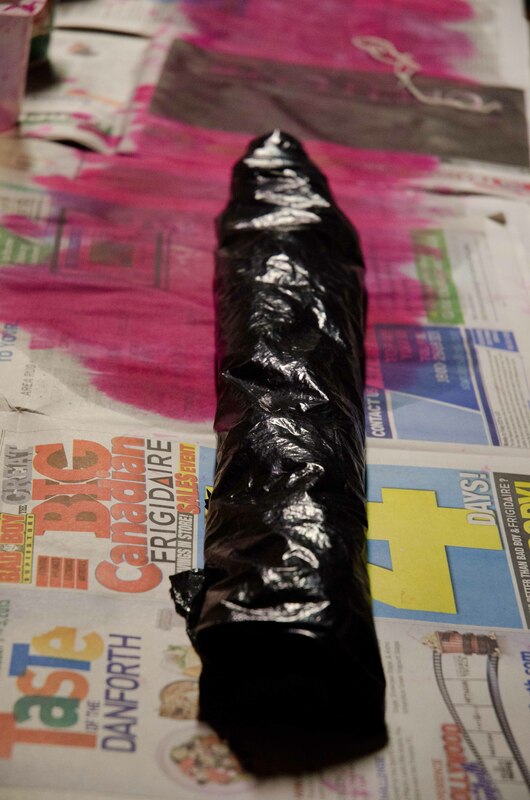 After the warp is painted it has to be left in at least 70⁰ F (21⁰ C) for 24 hours for the dyes to react. If it is warmer you may need less time. 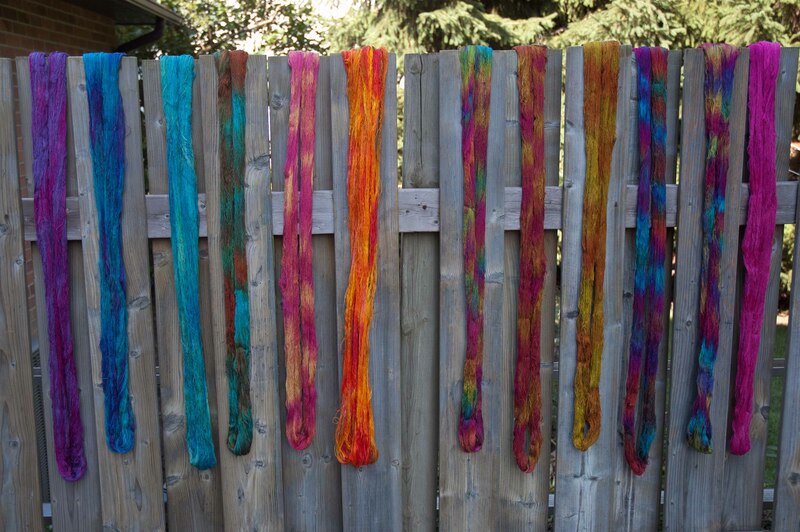 We have it hot and humid here in Ontario right now so leaving the warps outside to react is a great place. If I do any warp painting in the winter, I place the painted warps in a cooler with a hot water bottle for 24 hours, it works well. The warps were washed and dried afterwards and now I have a lot of work weaving them but it will be fun. I will share some pictures with you as I am weaving them. It will be a while before I get to weave my scarves because right now I have a big project on my loom that I cannot share with you because I plan to enter it into Convergence 2016 Yardage Exhibition. I guess I can share a picture of my loom with the project on it. My next dying job is going to be snow dying but I will have to wait for the snow to arrive.